Autumn has hit and everyone’s going Rad for Plaid, and I am loving it! I love playing with mixing patterns and plaid. Imagine a plaid scarf with a polka dot sweater? Fun! Before I moved to the USA 7 years ago, I had never heard of Plaid. It was called Flannel in Australia. Plaid is also known as gingham, flannel, burberry, tartan, checked, and checkerboard, the list could go on. If you have some more names, throw them at me in the comments below. This shirt is current, so run, don’t walk to Target. But, I’m going to put a spanner in the works and tell you I can’t, for love nor money, find the link on the Target site to this shirt. I can tell you however, that my label says “LS Top Ebony Check 513592” / $24.99. I adore the length. It’s a half button down and I love the gold lines (hard to see in pic). I’ve found similar at Old Navy HERE. I am wearing “The Sutton” from Stella and Dot and have tucked it under the collar. Great way to pull a necklace like this onto a button down shirt. www.stelladot.com/melissamenzies. 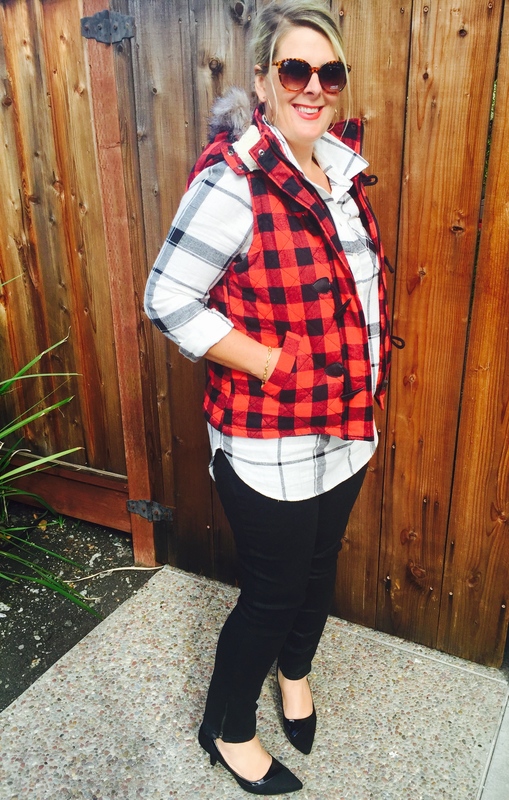 This black and red checked sleeveless vest is current at Target. Play with mixing it with other plaid, as shown here, or try a plain white long sleeved tee. Hood is removable, faux fur. Details HERE on this red Mossimo Puffer Vest from Target / $39.99. 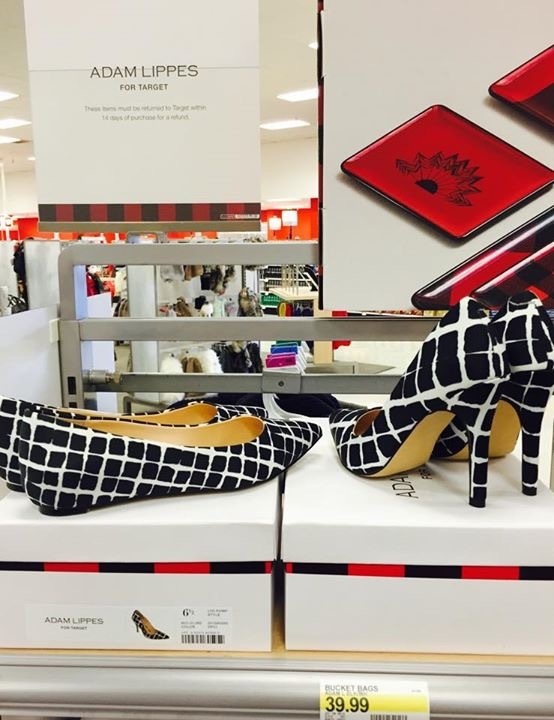 I just love when designers collaborate with Target, a constant these days. These shoes are current and so much fun, not your traditional plaid pattern. I have a striped black/white shoe that I have pulled into so many outfits, so I can see these doing just that. And I love the choice of heels or flats. I’d want both – LOL. Great price to boot, only $39.99. Looks like you need to make your way into Target! 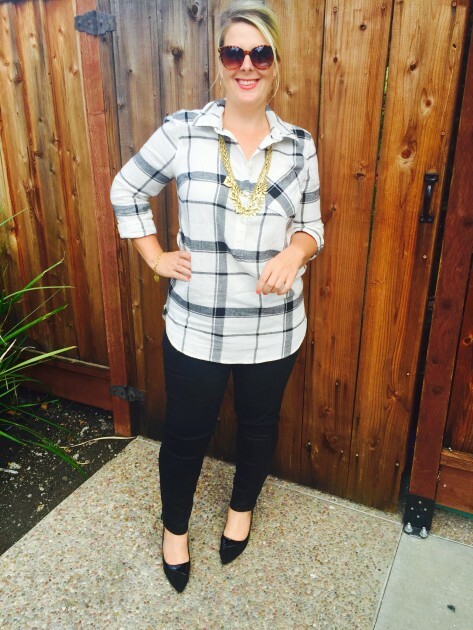 There are many other ways to add plaid, more subtly, with shoes! This set is on my Polyvore account. From heels, to flats, to slip on sneakers and gumboots (rain boots). 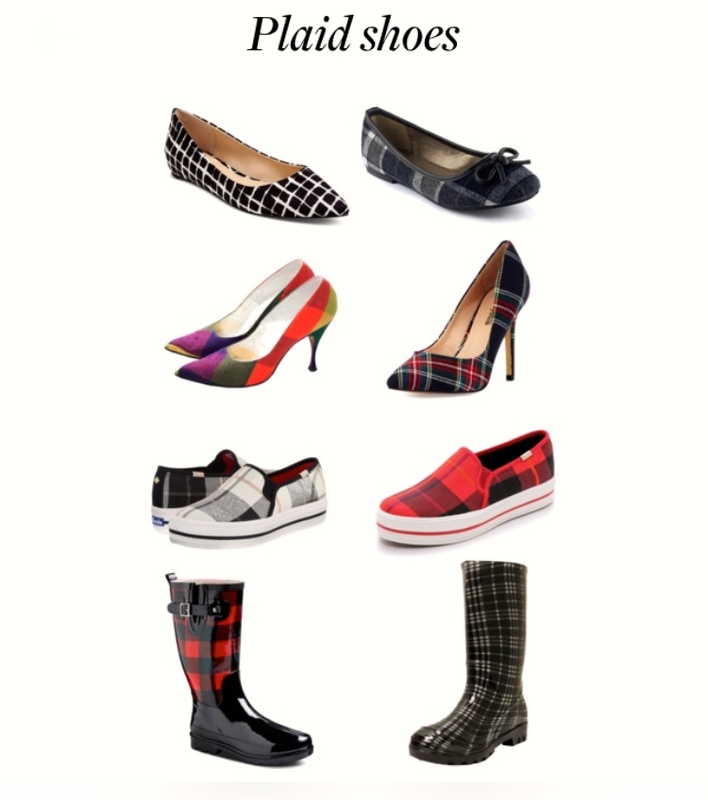 To see the details of this Polyvore set on Plaid Shoes, click HERE. I have them from as little as $15! Another great way to add plaid, even more subtly. I have tried these Salon Effects nail strips myself and it was so easy and fun to do. They were only good for a fun weekend, but aren’t most nail polishes anyhow! You can find these at Target, Walgreens, CVS, just to name a few. 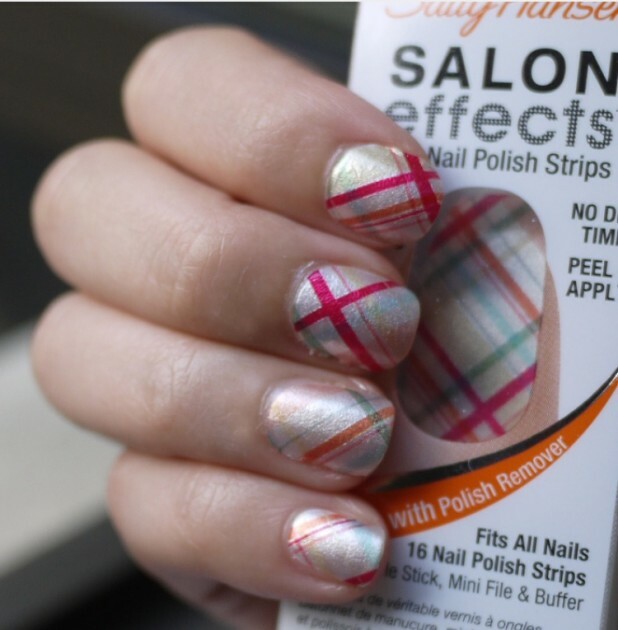 For the post I wrote on my own experience using Sally Hansen Nail Effects, click HERE . 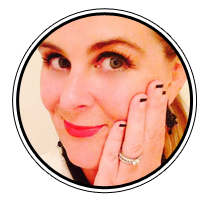 This set was on my post last week about Defining and Dressing for your body type. 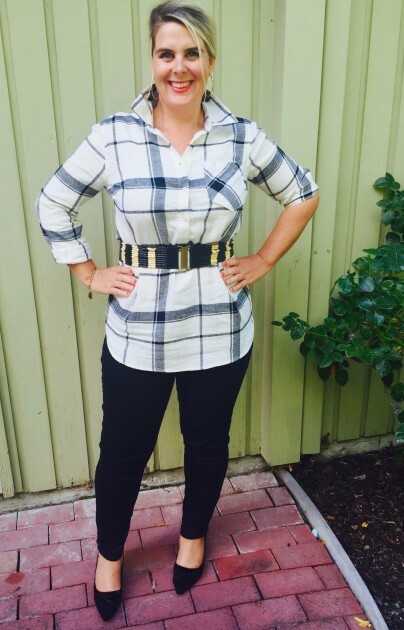 Plaid is a great way to bring the attention to your top half when you have a pear shaped body. Love the Freya Fringe necklace here! www.stelladot.com/melissamenzies All items are current on my Polyvore. Plaid can indeed be worn with heels and leggings. The length of this shirt covers me behind and still gives me length to add a belt to define my waist. 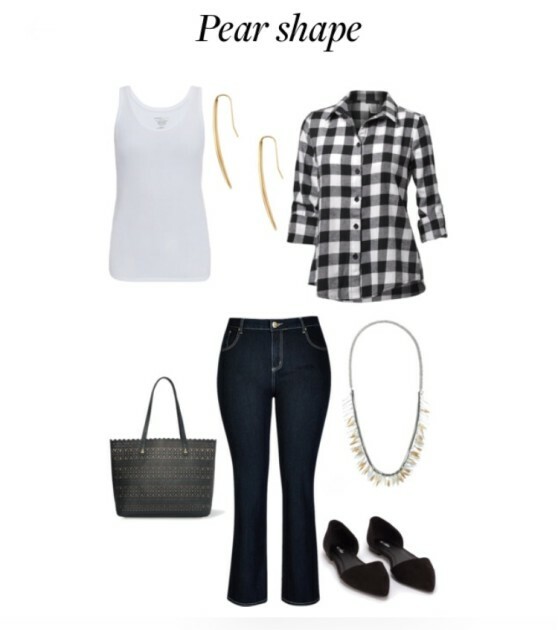 This is another example of dressing my pear/hourglass shape figure. Showing my curves and waist, tastefully. And would you believe I picked this beaded belt up from Anthropologie for $5, reduced from $58. You never know, there might be some more still at your local Anthropologie store! 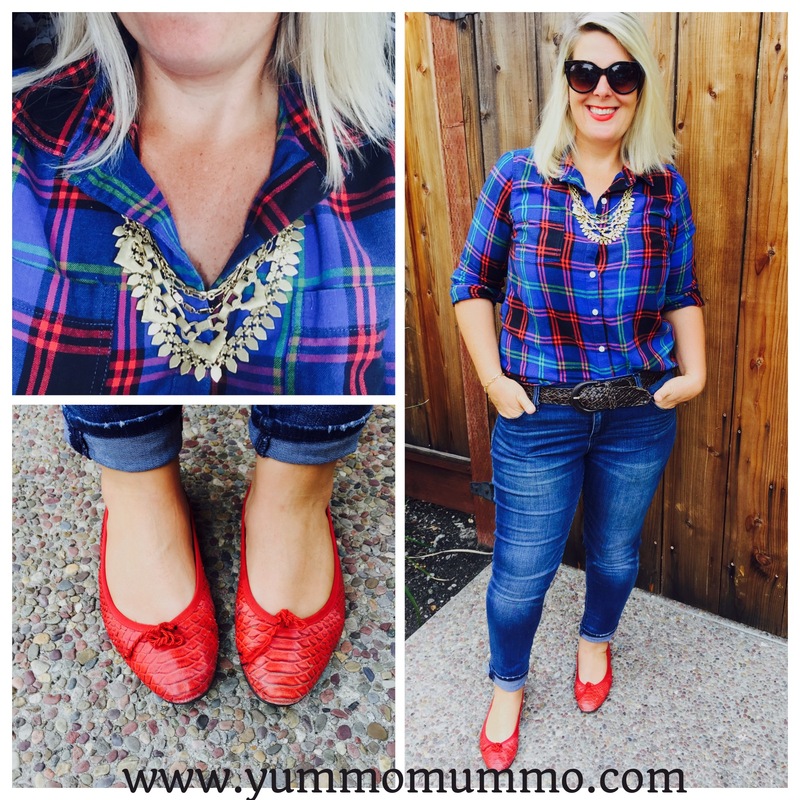 I love plaid, and I love the way you put these outfits together! Especially digging the last picture with the leggings, perfected with the belt. Beautiful, and great post! Great post! Plaids are so hot this year, and alas, I don’t think I currently own any. Wish I’d saved my purple plaid shirt from college. I especially love your blue plaid shirt. Was that a recent purchase? I didn’t see the brand on that one, and I adore it! I love your plaids and love the nail stickers too!